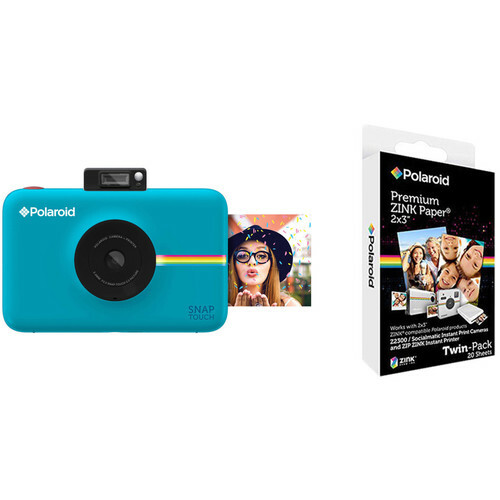 Comprising everything needed to begin shooting, the blue Polaroid Snap Touch Instant Digital Camera with ZINK Photo Paper Kit from B&H bundles the unique digital instant camera with a 20-sheet pack of ZINK photo paper for producing instant prints. 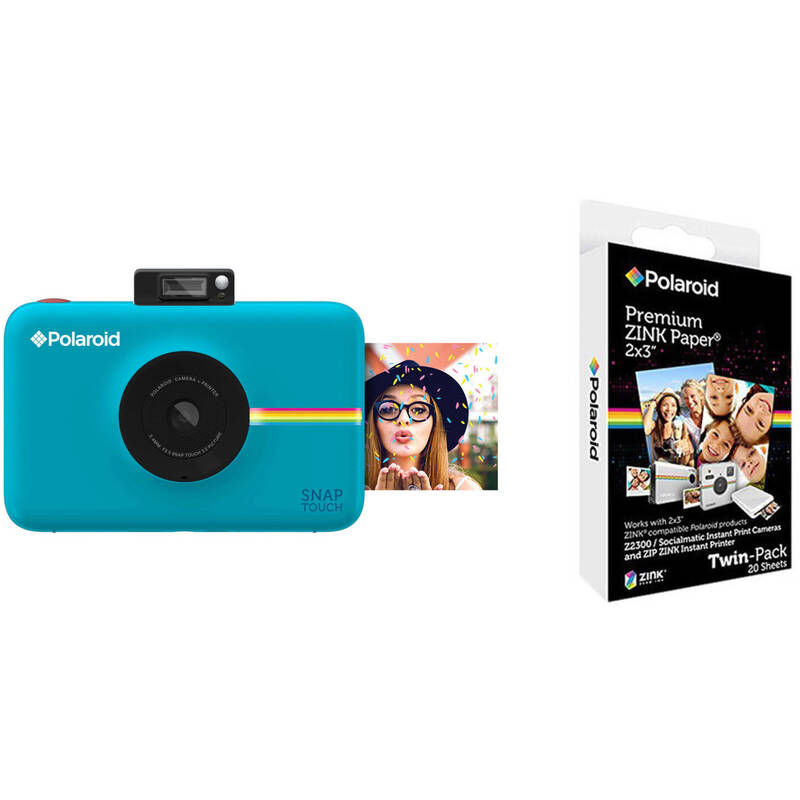 Polaroid continues to offer the fun of an instant camera plus the advancement of digital photography with this blue Snap Touch Instant Digital Camera. It offers the convenience of digital capture with the ability to produce a physical instant print, thanks to ZINK Zero Ink Technology. The 13MP 1/3.2" CMOS sensor works with a 3.4mm f/2.8 lens, equivalent to 25.8mm in 35mm terms, to provide users with a pocket-sized option and multiple photographic options. The 3.5" touchscreen LCD display on the rear of the camera makes framing, taking pictures and full HD 1080p videos even more convenient. The Snap Touch includes a photobooth and burst mode as well as the ability to edit pictures through filters, borders, and digital stickers. An automatic timer in conjunction with the built-in selfie mirror allows you to take a confident selfie without the need for a retake. A microSD card slot allows you to use a microSD card up to 128GB for image transfer, and a micro USB port and cable makes it easy to charge. Additionally, the camera is equipped with Bluetooth connectivity. Printing is possible with ZINK Zero Ink Technology found in a few other Polaroid products. This camera shares many features with the Snap Instant Digital Camera and Zip Mobile Printer, including a print size of 2x3", a print speed of under one minute, and the ability to hold up to ten sheets of ZINK photo paper. It is powered by a built-in rechargeable Li-ion battery. For use with ZINK-compatible cameras and printers, this 20-sheet pack of 2 x 3" Premium ZINK Photo Paper from Polaroid will give new life to your printer and allow you to create vivid prints using Zero Ink printing technology. These are used for borderless photos and feature peel-off adhesive backing for immediately sticking them on a wall or board for display. Also, they are smudge, tear, and water resistant and dry instantly for handling right away. Box Dimensions (LxWxH) 7.25 x 6.9 x 2.0"
Box Dimensions (LxWxH) 4.8 x 2.6 x 0.65"
can you print the picture right from the camera? Does the camera ever need ink replaced?